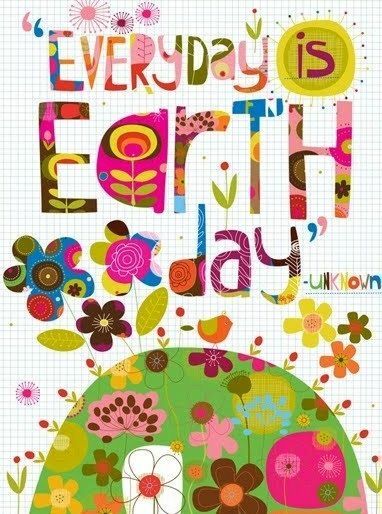 April 22, 1970 marks the very first Earthday Celebration. There are so many organizations that bring recognition to this day, everyday including the Earth Day Network. In the Design/Building Community, the USGBC has been on the forefront of awareness and innovation for responsible design and construction. I am currently a LEED Accredited Professional with a ticking clock to complete a lot of CEU’s to maintain my title. This has been an important credential to me since obtaining it in 2004. So much has changed, or rather evolved since then and the CEU’s are important so I must decide how and when I’m going to get them all done. As a Design Professional and Educator, I feel it’s important to practice responsibility to our environment through Design. With that statement, I must make a pledge to complete my continuing education and continue to educate others. So that’s what I’m gonna do…. I’m also going to continue to do the ‘small stuff’ because I know it’s part of a big difference. I will recycle. Even though I despise collecting giant piles of trash on the side of my house…it’s better than going into a landfill. I will not throw away plastic bottles when I use them. It’s usually when I’m work and I actually do keep a bag under my desk. As it fills, I take it to my daughter’s school for their recycling efforts. I will continue to bring my own tote bags. Occasionally I forget, or they all end up in the house, but I will try my best. Our city is banning plastic, so that is a good thing! Extra effort or a fine. I will bring my own containers, not ziplock bags. Even though I leave them in my car and they grow mold…I’ll wash it off and use it again! I will repurpose whenever possible. I’ll make something new out of something old. Small stuff – big differences. Released in 1991, this Dramarama song is still one that I love and remains on my permanent playlist. It also serves as a source of confusion since Earth Day is celebrated on April 22, but….whatever, it’s a good song! You should download it today. I don’t knowWhat are we gonna do? It’s April 21st and everybody knows today is Earth DayMerry Christmas, Happy Birthday to whoever’s being …. Happy Earth Day! What are you gonna do? I absolutely believe in doing what you can not to just throw things away. There are so many things that can be recycled and it just makes me crazy to see it happen. I’m so happy for you on your credential! You have had that for a long time and I am sure have made very lasting impacts with all you do! This is great! I remember going to the quarry by our house every earth day for an earth day festival. Our schools were all about the recycling efforts way back when and I still remember a contest I entered with my earth day picture, which won! Thanks for bringing back memories today 🙂 I am a recycler myself! I’m with you – not perfect at being earthy, but I do try. I really do try to avoid using plastic. And I am def a thrift store shopper. I love the variety. I’m also not into buying a bunch of toys and such for birthdays and holidays. We make it about spending time and creating memories. Now, I CAN do better with our recycling efforts. Right now, we do cans. I also try to use newspaper and cardboard in the garden as mulch. I like having this reminder! Great suggestion to practice Earth Day every day Charlene! I love how more and more communities are doing regular recycling collection for the residents for items other than paper and glass (which gets picked up once a week for me). I put a box in my garage and fill it up with used batteries, broken small appliances, light bulbs, etc and then on collection go drop it off.